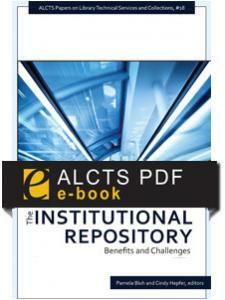 This collection arms readers with the information they need to begin planning a successful institutional repository. Pamela Bluh is associate director for technical services and administration at the Thurgood Marshall Law Library, University of Maryland Francis King Carey School of Law, where she is also responsible for the law school's institutional repository, the Digital Commons@UM Law. She has been active in the Association for Library Collections and Technical Services (ALCTS) for many years, having served as chair of the ALCTS Serials Section, chair of the Fundraising and Continuing Education Committees, and president of ALCTS (2007–2008). As editor of the ALCTS Papers on Library Technical Services and Collections from 2003 to 2006, she worked closely with Cindy Hepfer to edit several publications. She was awarded the 2004 ALCTS Serials Section's Bowker/Ulrich's Serials Librarianship Award for her contributions to serials librarianship and received the 2012 Ross Atkinson Lifetime Achievement Award. Cindy Hepfer was continuing e-resource management and cataloging librarian at State University of New York at Buffalo; she is now retired. Greg Tananbaum is the owner of ScholarNext Consulting, focusing on issues at the intersection of technology, content, and academia. Clients include Microsoft, SPARC, PLOS, Annual Reviews, NISO, the American Heart Association, and eLife. Greg has more than fifteen years of experience in the scholarly communication space. In addition to his consulting work, he has served as president of The Berkeley Electronic Press, as well as director of product marketing for EndNote. Greg writes a regular column in Against the Grain covering emerging developments in the field of scholarly communication. He has been an invited speaker at dozens of conferences, including the American Library Association, the Society for Scholarly Publishing, the Association of Professional and Learned Society Publishers, and Online Information UK. Marisa Ramirez is digital scholarship services librarian at California Polytechnic State University, San Luis Obispo. In this position, she supports the development and implementation of library services to reflect the changing landscape of scholarly publishing. In addition to overseeing outreach, content recruitment, digitization, and ingest for the campus repository, Marisa provides instruction and consultation to Cal Poly students, faculty, and staff on issues related to copyright and fair use, scholarly communication and open access, publishing, and emerging e-scholarship efforts. In collaboration with the Grants Development Office, she is also responsible for supporting data management planning. 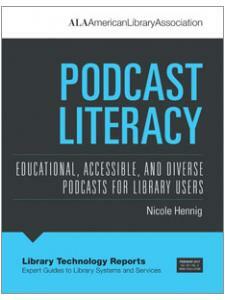 She is active in the Association of College and Research Libraries (ACRL), most recently serving as the cocreator and convener of the ACRL Digital Curation Interest Group. She also serves as chair for the Digital Libraries Special Interest Group of the Association for Information, Science and Technology (ASISandT) and is the cofounder and co-editor of the Journal of Librarianship and Scholarly Communication, an open-access journal that focuses on the intersection between technology, the economics of publishing, and the evolving role of the library. Michael D. Miller is vice provost for information services and chief information officer at California Polytechnic State University, San Luis Obispo. Information services consists of IT Services, the Robert E. Kennedy Library, and the Center for Teaching, Learning, and Technology. Miller reports to the provost and is a member of the President's Leadership Council. He is also a member of CSU's Information Technology Advisory Council (ITAC). Previously Miller was dean of library services at Cal Poly. Prior to joining CalPoly, Miller served as the director of arts and engineering libraries at the University of Michigan and one of the founding directors of the Duderstadt Center, the University of Michigan's showcase for information and instructional technology. He was formerly head of the Undergraduate Library at Stanford University where he was responsible for campus media services and all public computing sites. He was the founding director of the Johnson Center Library at George Mason University, an innovative mixed-use facility, and the founding director of the Avery Fisher Center for Music and Media at New York University. Allison Sivak has been the assessment librarian at the University of Alberta since 2007. Prior to that, she worked for four years as a research associate on the first national study of human resources in Canadian libraries and was a founding member of the Human Resources Network of the Canadian Library Association. She was a copresenter, with Leah Vanderjagt, of the ALCTS webinar, "Perpetual Beta: Early Literature about Institutional Repositories and What Assessment Can Tell Us Now. Leah Vanderjagt is the digital repository services librarian at the University of Alberta, where she administers ERA (the campus digital repository) and its associated services, collaborates with colleagues to develop strategies to recruit content for the repository, and communicates with and supports campus users of the Open Journal System and the Open Conference System Hosting Service. Previously, Leah worked as the education programs lead and clinical research librarian with the Complementary and Alternative Research and Education (CARE) program at Stollery Children's Hospital. CARE is the first academic pediatric integrative medicine program in Canada. Leah has also worked for U of A Libraries in the Humanities and Social Sciences Library and in the Data Library, delivering GIS and spatial data services. She is one of the two inaugural coconvenors of the Canadian Library Association's Open Access Interest Group. Her professional interests include open access initiatives, government information policy, advocacy movements for information access, and research librarianship. Marilyn S. Billings is the scholarly communication and special initiatives librarian at the University of Massachusetts Amherst, a position she has held since 2006. As head of the Office of Scholarly Communication, she provides campus and regional leadership and education in alternative scholarly communication strategies and gives presentations on author rights, new digital publishing models, and the role of digital repositories in today's research and scholarship endeavors as well as providing oversight to the UMass Amherst digital repository ScholarWorks@UMass Amherst. Marilyn is actively involved in regional and national workshops on these topics, most recently the Academic Library Futures Symposium at Rice University in September 2012, the Living the Future Conference at University of Arizona in April 2012, and the international Scholarly Publishing and Resource Coalition (SPARC) OA workshop held in Kansas City in March 2012. Her most recent activity has focused on her work as a campus leader and national speaker on the topic of alternatives to high-cost textbooks, the use of open educational resources, and coordinator of the Open Education Initiative (OEI) launched at UMass Amherst in spring 2011. Sue Kriegsman is the program manager for the Harvard Library Office for Scholarly Communication where she is responsible for identifying and implementing ways for Harvard to open, share, and preserve scholarship. Since joining the Harvard Library staff in 2001, Sue has worked on a variety of digital initiatives such as the Harvard-Google book digitization project for which she served as the project manager. She also manages the Harvard Library Lab, an entrepreneurial program that supports the creation of lightweight, open, and scalable projects bringing innovation to the library. Prior to Harvard, she was the project manager for the Colorado Digitization Project. Lisa A. Macklin is the director of the Scholarly Communications Office for Emory University Libraries. As both a librarian and a lawyer, Lisa focuses on copyright, licensing, and scholarly communication issues, working with faculty and students on the application of copyright law to teaching, research, and scholarship. Her interests include copyright, transformations in scholarship and publishing, including new models of scholarship in digital form and the open access movement. She has been an active member of the ACRL Research and Scholarly Environment Committee, including serving as vice chair and chair.